Well the videos show what a crisp and clean routine looks like. However there isn't a video for the lefty routines. Why?!? Because of that I won't even show my daughter this because I don't want her to get confused. And I agree with others. There should be a slow mo version. The lack of sound on beam, vault and bars is really weird too. 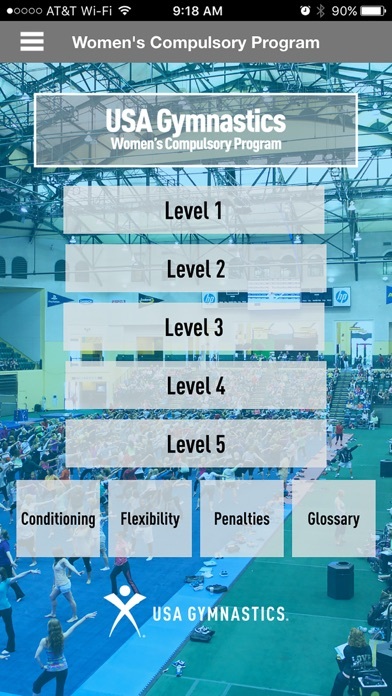 The text description is helpful but as a parent of a gymnast it's not valuable to me. Only for a coach. So I wonder who the target audience is for this app. For parents it shouldn't be more than $10. Maybe strip out the text and illustrations and just sell the videos for less to non coaches. I love this app so far! I am studying for my judging test and it has been a great tool. The only problem I have experienced is when I downloaded onto my iPad, the app icon doesn't show up as rather red 'women' logo, but when I downloaded on my iPhone, the icon is there. It makes it so easy to learn the routine with the videos and the side by side illustrations. Very happy with it so far!! I have attempted to post this review three times now. This time will be shorter and to the point but I want to make sure I stop others from being ripped off by USAG and this terribly expensive, less than helpful app. This is the same routine video I have seen 1000 times before, for free. There is no tutorial video with step by step directions available. That was the only reason I purchased this overpriced app. What a huge disappointment. App contains no more knowledge than I previously had available. I don't get sound on either my phone or iPad. I've deleted and reloaded it a few times. We need the music on the floor routine. Any tips? When the app was opened it froze. I am so disappointed as I use this app quite often and now it no longer works. I'm hoping for an update soon to fix the glitches. Unfortunately my iPad is set to do automatic updates and this app does not work now that it's been updated. I have had this app installed for almost a year and now after the most recent update it no longer works.